Ianfs wrote: Both twins Chris. Ok. But the seawings is single. Agreed but, my point was and I really didn't explain it properly, sorry about that, the Sealine S28 and Fairline Targa 29 have twin engines and weigh approx. 4000 kgs. The AD31P 150hp engines will get them both on the plane but it takes a bit longer and sometimes with lots of people on board they struggle a lot, I know I've been on board a couple. So this is why Volvo added the compressor and called it a KAD32. 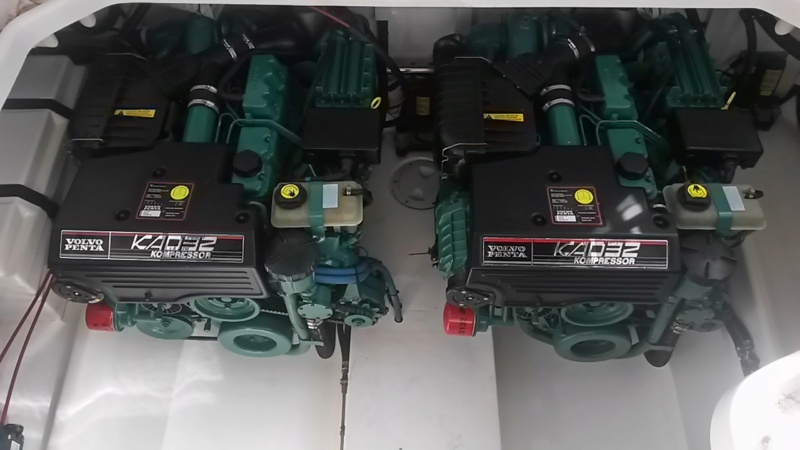 I have subsequently been out in both the Fairline and the Sealine with these engines and there is a marked difference. How is the ad31 going to handle 2tons of 24ft boat. I know it wont be a rocket ship but i dont want to have to ask my passengers to relocate into the cabin in order to get in the plane either , any thoughts. ? Am i right in assuming that the power delivery charsctersistics of 150hp diesel will be different to equiv petrol? I think the Seawings will handle ok with the single engine, it's half the weight of the other two I mentioned and it is some 6ft shorter and 2ft narrower so with a 150HP engine she will do just fine. You are right she won't be a rocket ship but power delivery will be acceptable because of the torque available. I'm not sure about a direct comparison with a petrol engine I'll let someone else answer that one. The supercharger (kompressor) is top left of each engine.